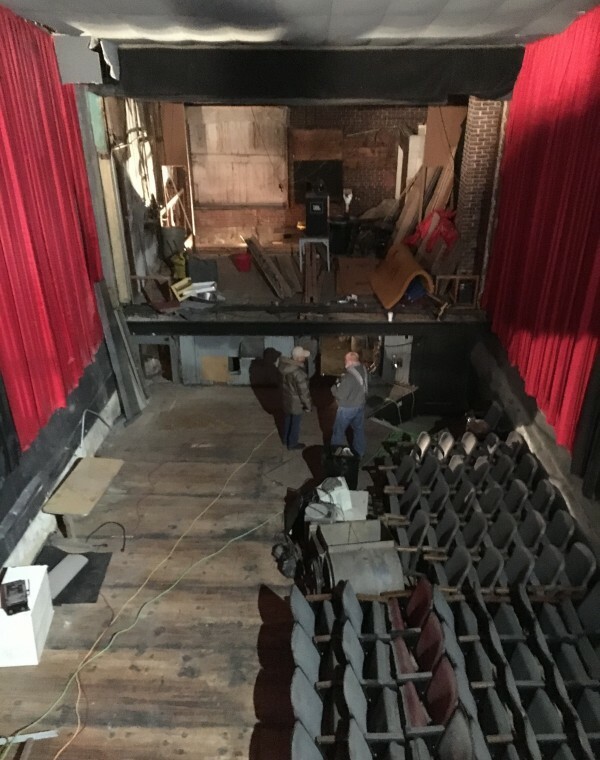 This morning, members of the Madison County Chamber of Commerce and several guests were treated to a tour of the historic Iowa Theater, in the beginning stages of its restoration. View from the second story, behind the old balcony and projection room. Still a diamond in the rough, but making progress! Marianne’s husband, Mark, personally unbolted all 150 seats from the wood floor over Thanksgiving. 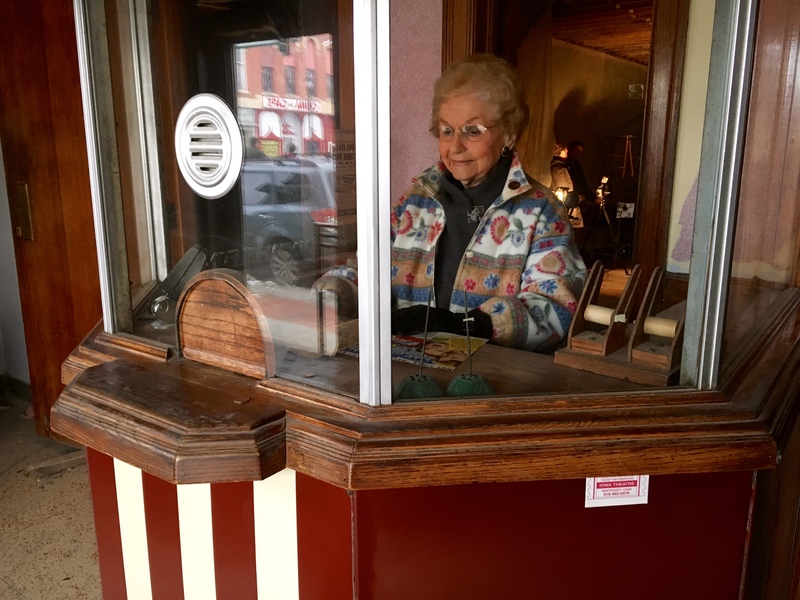 On hand to add their stories and memories to today’s walk-through were Jane Martens, who operated the theater’s ticket booth when she was in high school, and Fred Kuntz, who was the projectionist while in high school in ’39 and again in the 50s. Jane couldn’t remember for sure, but she estimated her hourly pay for working the ticket booth was 35 or 40 cents per hour. Her favorite part was seeing all the people, and she has MANY stories to tell! 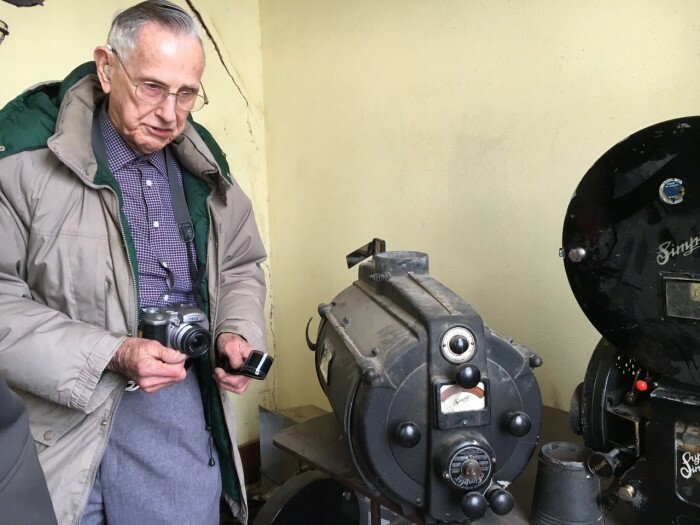 Mr. Kuntz, who graduated from Winterset in 1940 with Marianne’s father, is helping to restore one of the carbon-arc 35mm projectors still located in the upper front room of the theater. After his time in Winterset, he went on to a long and successful career in radio at WHO. 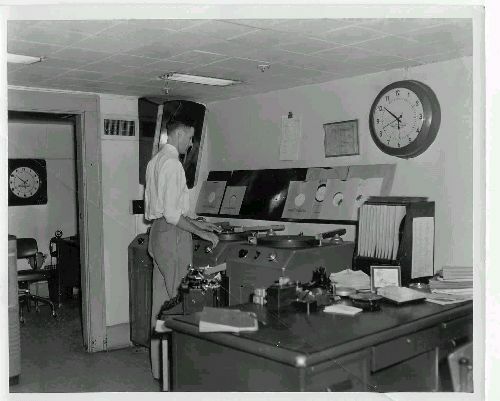 Click to see this photo and others of Mr. Kuntz and his colleagues at WHO Radio in the 50s and 60s. Ideally, the theater will be open in May of 2017. 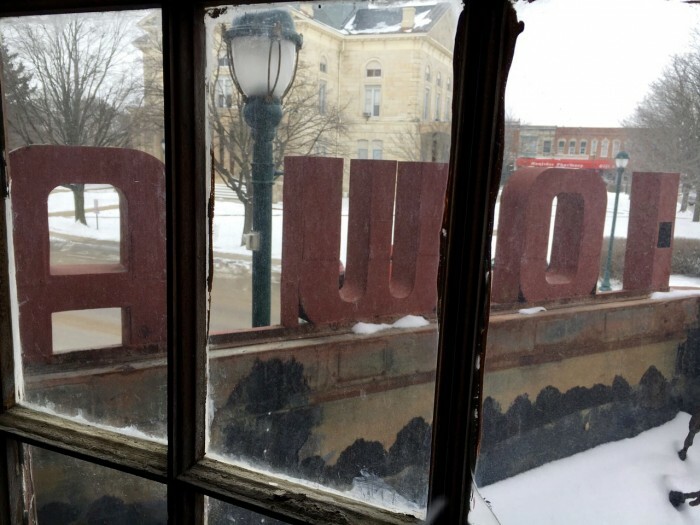 In the meantime, be sure to like The Iowa Movie Theater on Facebook to see photos of their continued progress. They’d love to hear from you if you have old photos, stories to tell, or an interest in partnering with them in this great project. There’s a girls and boys varsity basketball game at home this evening (Friday) vs. ADM, starting with the girls at 6:00. Go Huskies! And speaking of school: Each year as part of the evaluation process of our Superintendent, Dr. Susie Meade, the Board of Education collects feedback from students, parents, community members and school employees. There is a survey on the front page of the district’s website that you are invited to take if you fit into one of those categories. You can also access it directly here. The survey will be open through February 8th. On Saturday morning, come and hear the Legislative Form at Farmers & Merchants State Bank Community Room, 101 W. Jefferson St. from 9:00 to 10:00 am. During this time, you will have the chance to visit with our state legislators in the Iowa Statehouse, Representative Stan Gustafson and Senator Julian Garrett. This event is free and open to the public. Mr. and Mrs. David Wiley are hosting a monthly Game Time at the Library starting this Saturday afternoon at 1:00 pm. Game Time is for all board games, and open to all ages. It is free and open to the public. Stop by and learn a new board game, or bring your own to play and share. Dance Away Your Winter Blues at The Winterset Stage on Saturday evening from 7:30 to 10:30 pm. The café will be open for snacks and drinks. Cover charge is $8 for a single, $12 for a couple. Contact The Winterset Stage at info@thewintersetstage.org for more information. 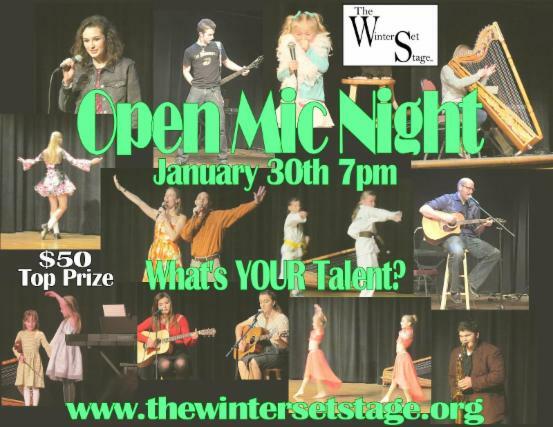 Also, The Winterset Stage is still seeking talent for the next Open Mic Night. Mark your calendar for January 30th at 7:00 pm, and give them a call in advance if you want to be part of the lineup! 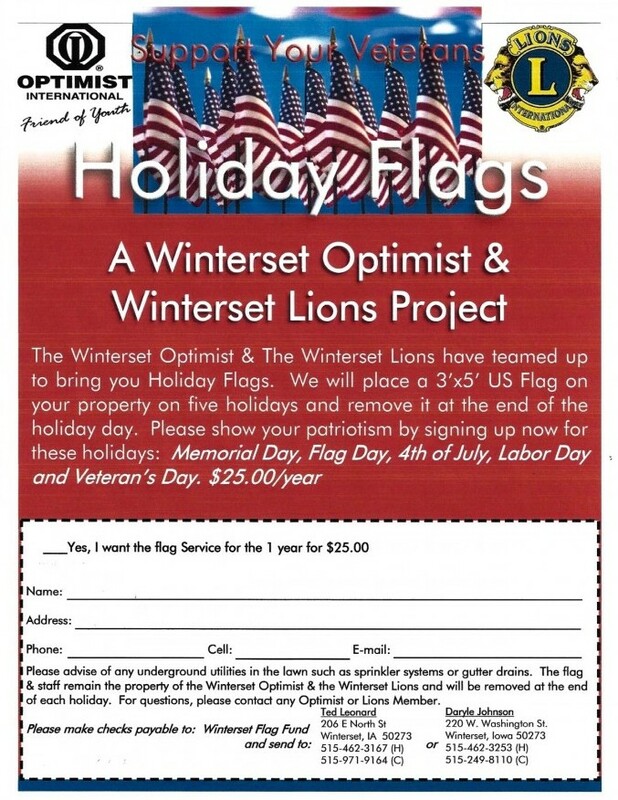 There’s still time to sign up for the Winterset Optimists’ and Winterset Lions’ Holiday Flags Project. If you participate, you will have a 3×5 foot U.S. flag placed on your property during five upcoming holidays – Memorial Day, Flag Day, 4th of July, Labor Day, and Veteran’s Day. Optimists and Lions Club members will set up the flag for you and remove it at the end of the holiday day. This service is just $25 per year. Click here for a printable pdf to mail. 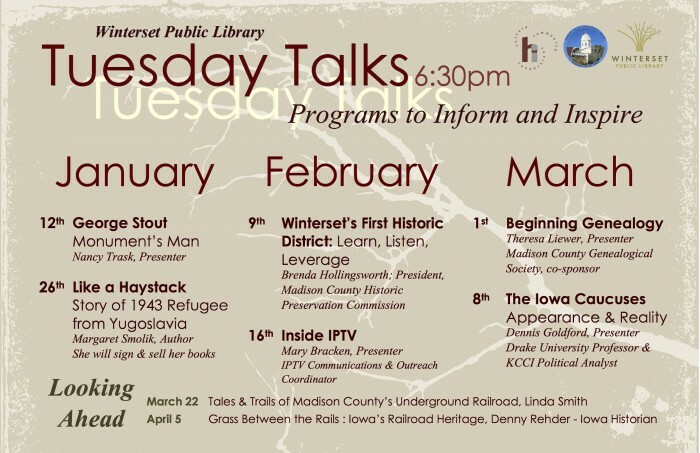 Join Tuesday Talks at the Winterset Public Library for fun and informational presentations every other Tuesday evening at 6:30 pm. The next talk, “Like a Haystack,” will be on Tuesday, January 26th. Author Margaret Smolik will be there to share her story about a 1943 refugee from Yugoslavia. Call the Library at 515.462.1731 for details, or to recommend a presentation idea. 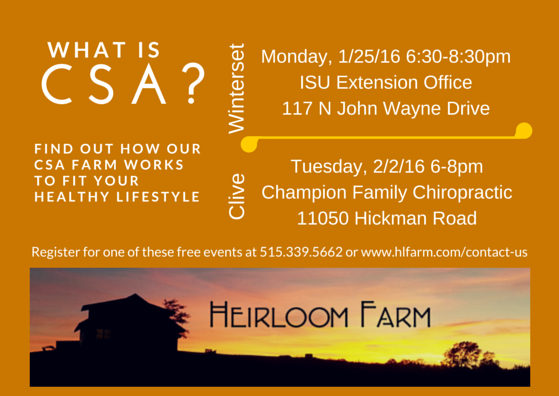 Join Heirloom Farms for a discussion on What is CSA? Monday, January 25th from 6:30 to 8:30 pm. Learn about Community Supported Agriculture, how Heirloom Farm operates, and see samples of what they grow. If you enjoy garden fresh produce, but don’t have the time or energy to grow it yourself, CSA is for you. Click here to learn more about Heirloom Farm. The Madison County Chamber of Commerce Annual Meeting & Awards Night will be on January 28th, from 5:30 to 8:00 pm at the Jackson Building. Click here for online registration. 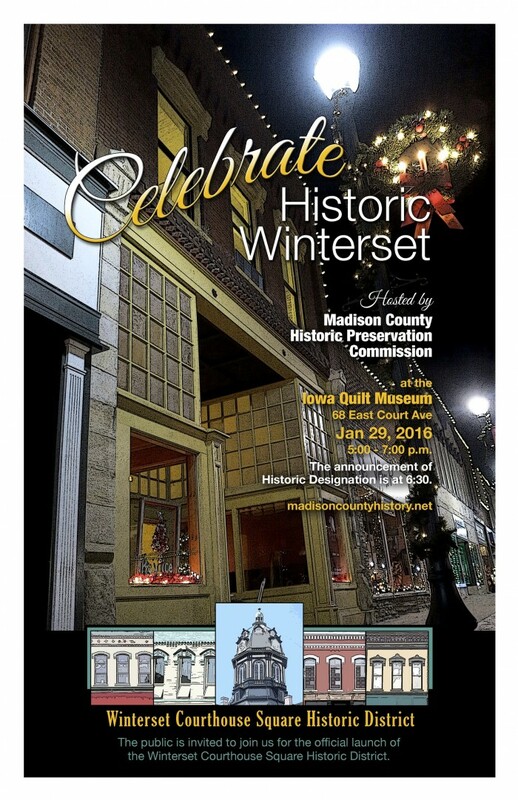 To celebrate the Winterset Courthouse Historic District being officially added to the National Register of Historic Places (See the news story on WHO-13 here), the public is invited to attend the official announcement at an evening reception on Friday, January 29th from 5:00 to 7:00 at the future home of the Iowa Quilt Museum (68 E. Court Ave.). Enjoy complimentary hors d’oeuvres and wine while hearing several brief presentations about the National Historic Register and what it means to property owners, local business people and residents. The official announcement will be made at 6:30 pm that evening. 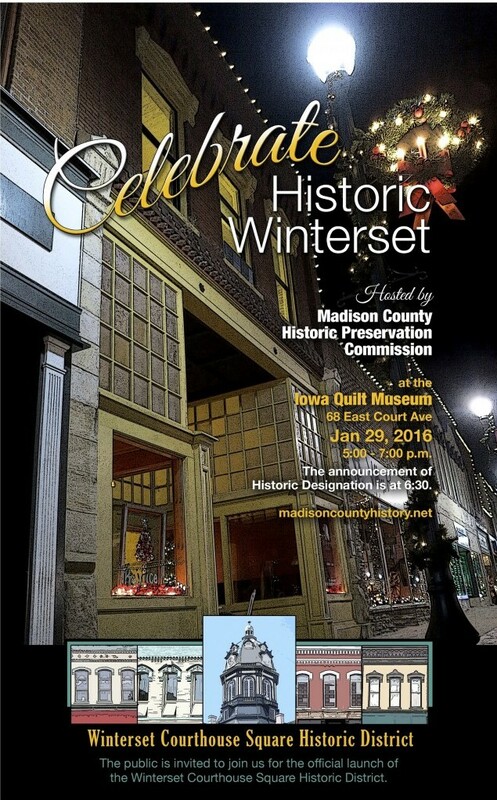 More information about the celebration event and the project itself can be found at www.madisoncountyhistory.net. That’s all for now. Thank you for reading The Winterset Citizen!